Personalized Favorlight Glass Votive Candle Favors - Add a touch of romance to your reception dinner by lighting a Personalized Favorlight Glass Votive Candle Favor at each place setting! We print the first names of the Bride and Groom, Wedding Date, and 1 of our 38 glass votive designs in your choice of 8 ink colors on each crystal clear Personalized Favorlight Glass Votive Candle Favor. Your guests will love to take home and enjoy a memento of your celebration. Personalized Favorlight Glass Votive Candle Favors are 2.25 inches tall and include a 10 hour white votive candle. In addition to the design that you select, the first names of the Bride and Groom are printed, along with the Wedding Date. Please decide if you want the Bride's name listed first or the Groom's name listed first. 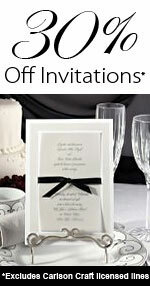 On the Dest 1 - Destination design, an optional 1 line location is printed between the first names & wedding date. Examples: Hawaii, Caribbean, Florida Keys, etc. See design in photo #2 above. On the H8 - Second Marriage design, the First Names of up to 6 children are also printed. Mr. & Mrs. ? 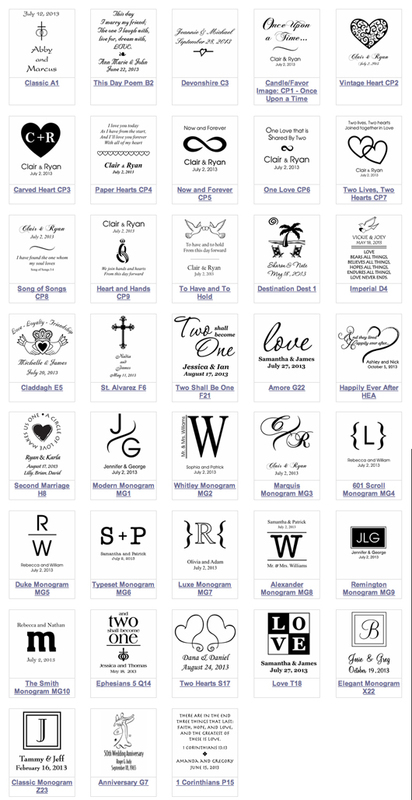 (Groom's Last Name) is printed to the left of the large initial. On the MG4 - 601 Scroll design, the Groom's Last Name Initial is printed in the center between the 2 scroll decorations. On the MG7 - Luxe Monogram design, the Groom's Last Name Initial is printed in the center between the 2 decorations. On the MG8 - Alexander Monogram design, the Groom's Last Name Initial is printed in the center between the horizontal lines, and Mr. & Mrs. ? (Groom's Last Name) is printed under it. On the MG9 - Remington Monogram design, the Groom's Last Name Initial is printed between the First Name Initials of the Bride & Groom. (In center box: Bride's 1st name initial goes first, then 1st letter of Groom's last name, followed by Groom's 1st name initial). On the MG10 - The Smith Monogram design, the Groom's Last Name Initial is printed in a large lower case letter in the center of the design. On the X22 - Elegant Monogram design, the Groom's Last Name Initial is printed in a square box above the first names of the bride and groom. On the Z23 - Classic Monogram design, the Groom's Last Name Initial is printed in a square box above the first names of the bride and groom. On the G7 - Anniversary design, the Anniversary Year is printed in addition to the first names of the couple and the wedding date. 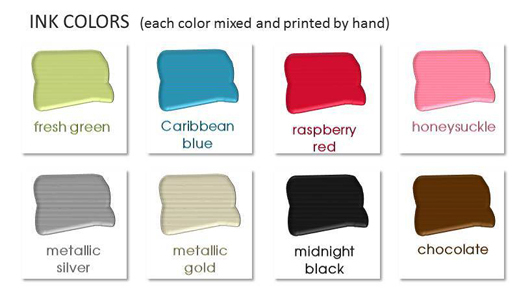 There is a minimum order requirement of 24 Personalized Favorlight Glass Votive Candle Favors.